Hey, everyone! I know I'm not usually promoting other books on here, but it's time for a first. I don't know how many of you know, but I'm a huge fan of Cassandra Clare's Mortal Instruments Series. Did I mention, HUGE?! 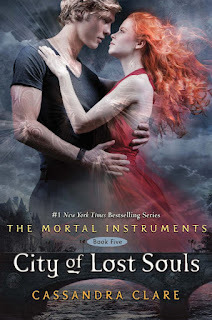 Okay, with that aside, I can't WAIT for City of Lost Souls. I just saw the book trailer, and almost died. So, I just had to share in case anyone out there has NOT seen this yet. Thanks Rachel I only watched the book trailer like twelve, okay thirteen times. Can't wait! I know, same here! It's addicting!